Kanazawa is located in the north-west of Ishikawa prefecture in Japan. The city rests between the Sai and Asano rivers, with the Japanese Alps in the east. Kanazawa is known for its large, historic Kenroku park. Considered one of the three most beautiful gardens in Japan, Kenroku-en is located in the heart of Kanazawa and is appreciated for its simple, yet elegant designs. 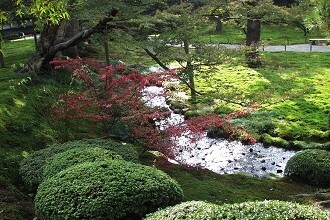 Kenroku-en was developed over many generations by the Kaga clan lords and the gardening style represents eternal life. Kanazawa also has the 21st Century Museum of Contemporary Art. The museum holds exhibitions from a variety of artists that change every few months. The most popular exhibit is ‘The Swimming Pool.’ Visitors get to submerge themselves into a waterless pool. From the top, the people in the pool look as if they are floating in water, while from below, people look up to see a watery ceiling. The Myouryuji Temple is also known as the Ninja Temple. The temple does not get its name from people skilled in ninjutsu, but from its deceptive architecture. The layout and location were a part of its defense against potential attacks from the central government. While it has many interesting layout features, one of the most fascinating is that it is built around a water well that has an underground tunnel to Kanazawa castle! Due to Kanazawa’s close proximity to the ocean, it has some of the freshest and most diverse seafood in Japan. Kanazawa is also home to kaga yasai, a leafy green vegetable, that is indigenous to the area. Another delectable dish from Kanazawa is Gori or small Japanese freshwater fish. These fish are marinated in soy sauce and ginger, dusted with potato starch and then deep-fried.